Many kids find they enjoy learning all about sports at a young age. This natural curiosity may lead them to develop a keen interest in a certain sports team, or they may find that they like several types of sports. 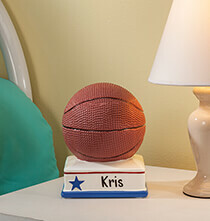 Either way, PersonalizedThings by Exposures has got you covered in the gift idea department. 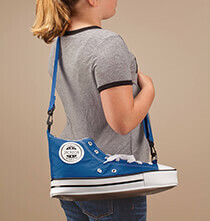 Browse our collection of colorful, kid-friendly gift ideas to find items for school-age children who engage in sports or who just love being a sports superfan. 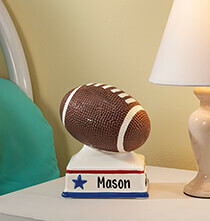 Parents and grandparents can start kids down the path to responsible money management with any of our sports-themed ceramic banks. 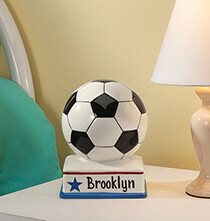 Imagine how excited your little sports fan will be when they receive a bank in the shape of a football, basketball or soccer ball. 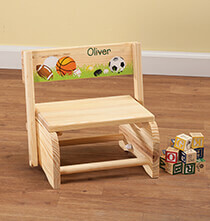 Our banks stand out and make wonderful decorative items for a child’s dresser or table. Plus, you can start them off with any amount of coins, which they can add to as they receive allowances or monetary gifts. They’ll get a kick out of seeing their name displayed on front, giving them complete ownership of their cash. Is your child, grandchild, niece or nephew active in local sports? Maybe they’re a budding whiz at gymnastics, ice skating or martial arts. 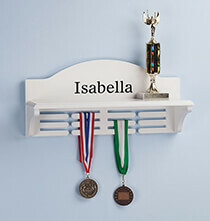 If so, you can give them a lovely personalized wall holder for displaying their ribbons and trophies. 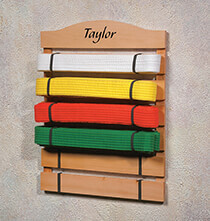 For the martial arts student, you can personalize a belt rack, a special gift for a dedicated student to have in their room as they earn each belt level. And you get the pleasure of knowing that each time they gaze at their display, they’ll see their name in bold text. 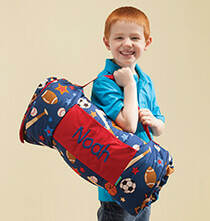 Kids who are constantly on the go to school or after school activities and their caretakers will appreciate having something cool to hold their collection of personal items. 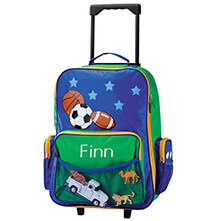 Make these kids smile by giving them their very own personalized sporty backpack or rolling luggage. Many of these items feature sports graphics and exciting color combinations. 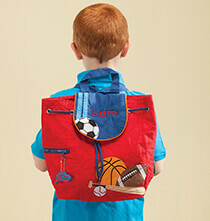 These practical items help keep kids organized in a fun, fashionable way.